The VIP Program is designed for broadcasters who've invested in our platform and continue to share live experiences on the app. As a member of the program, you'll have the opportunity to get recognized in the community, reach new viewers, and collaborate with other great broadcasters. As your community grows, you'll unlock even more benefits. If you're new to the app or just starting out, our community is always changing and growing, and we encourage you to try a different format, share a new adventure and find your niche with likeminded broadcasters. 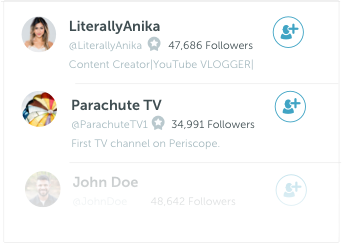 Every broadcaster adds a unique perspective to the app, and we're always on the lookout for new members to join the program. See below for the benefits and eligibility requirements for the program. Happy scoping! Get a special badge on your Profile and elsewhere in the app. Be prioritized in search results, so people can find you more easily. Collaborate with other broadcasters who share similar interests. If you create amazing broadcasts but don't meet the requirements above - don't worry! Our team is committed to helping everyone find their audience in the community and we're constantly on the lookout for new and creative broadcasters. 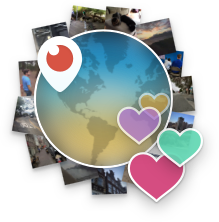 Make sure you tag @PeriscopeCo on Twitter so we can discover and watch your live experiences. If you create awesome content elsewhere (e.g. YouTube, Instagram, or another live streaming app) and are interested in kickstarting your profile here, you should still apply! VIP membership is subject to our discretion after meeting the minimum requirements above. Please note that existing and future suspensions of any kind will deem you ineligible for the VIP Program.